He quoted Mother Teresa herself describing one of scores of Memorare novenas: "In Rome during the Holy Year (1984), the Holy Father was going to celebrate Mass in the open, and crowds of people were gathered. It was pouring rain, so I told the sisters, 'Let us say a flying novena of nine Memorares to Our Lady in thanksgiving for beautiful weather.' As we said two Memorares, it started to pour more rain. We said the third … sixth … seventh … and at the eighth one, all the umbrellas were closing, and when we finished the ninth one, we found all the umbrellas were closed ..." The weather had turned beautiful. Mother Teresa's friend and spiritual adviser, Msgr. Leo Maasburg, described her confidence in the Memorare in his book Mother Teresa of Cal- cutta: A Personal Portrait. He called her "Flying Novena" her "spiritual rapid-fire weapon": "She took the collaboration of heaven so much for granted that she always added a 10th Memorare immediately, in thanksgiving for the favor received." "This is the most beautiful prayer," Mother Teresa would say, as quoted by Father Kolodiejchuk. "When we wanted to get a motherhouse, I promised Our Lady 85,000 Memorares. We were just very few sisters, and how to say so many Memorares? 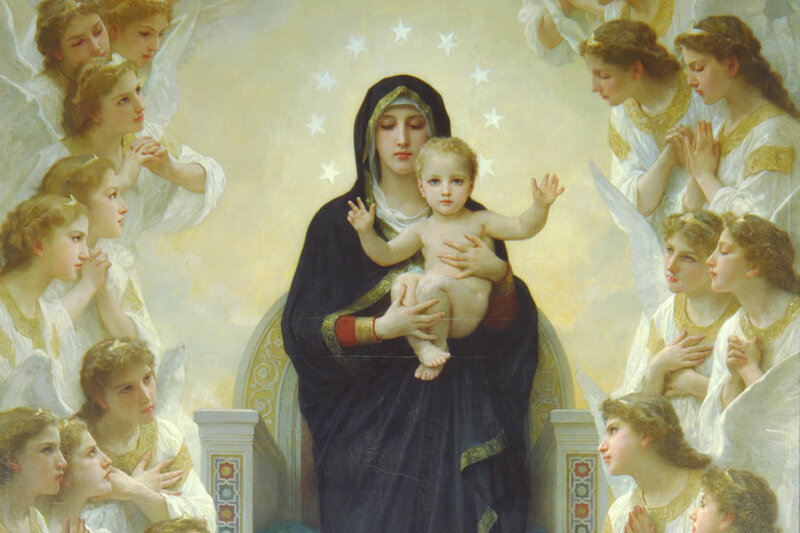 So we gathered all our poor children and all the people and taught them to say the Memorare — and soon we got this house." The saint's example has inspired President Stephen Minnis of Benedictine College in Atchison, Kansas. When he took the helm in 2006, that summer it appeared as if enrollment was going to decrease. So he shared the story of Mother Teresa and the 85,000 Memorares with his team of 10. He recounted telling his staff, "Let us commit ourselves to pray 1,200 Memorares apiece" for an increase in enrollment. "But we got 25 praying, which far surpassed my dream. By the end (of those Memorares), we got 1,232 students, almost 200 more than predicted during the summer. Mary had really helped us with that," he told the Register. In 2008, Minnis formed Benedictine's first "Memorare Army." "When we wanted to build a grotto and new building, we asked for 1,000 Memorares apiece, hoping to get 50 people. We wound up with 375 people. They promised to pray the 1,000 Memorares apiece for success in building the Grotto of Our Lady of Lourdes." Joining this army were the likes of Coach Lou Holtz and speaker Immaculée Ilibagiza. Ground was broken for the grotto in 2008, the 150th anniversary of the Marian apparitions at Lourdes and of the college's founding. The grotto was dedicated in 2009. And the school offered a public consecration to Mary Sept. 8, 2013. In 2012, when Minnis saw an increase of attacks in America regarding religious liberty and the First Amendment, he sought "enlistees" for the Memorare Army to pray 1,000 Memorares apiece. He said, "300 people signed up. That means 3 million Memorares were prayed for religious liberty in this country." The latest effort for the Memorare Army was in 2017, in praying for a science building to commemorate the 100th anni- versary of the science major on campus. That building is currently under construction. "Mary has continued to grace us with her love and her support," Minnis explained. "This is the five-year anniversary of our public consecration of the college to Mary. … We like to think it's because we are committed to her as well with the Memorare Army." Minnis added, "The prayer itself has been a real strength of ours, and of mine personally. People who have heard of this stor y have started their own Memorare Armies, hearing of our success and how Mary interceded on our behalf." Upon hearing of Benedictine's Memorare initiatives, the Catholic schools in Traverse City, Michigan, adopted the prayer. "We set a goal of half a million Memorares said to increase enrollment," said Eric Mulvany of the superintendent's administration. "We did achieve that number." And enrollment increased. "We are still praying the Memorare for enrollment. We continue with that prayer, as we do other prayers," he added.